Front-end developer, proficient in most popular technologies and frameworks. Team work player, adaptability and ability to work under the pressure, open-minded, fast learner, punctual, responsible. I am always trying to find creative ways to express and expand my knowledge of modern tech. Our specialists are taking part in a project working at issuing of certificates of electronic digital signatures. During the lifetime of this system more than 4mln certificates were issued with its help. Admin web application with latest Angular version and AngularCli. Tool for managing company advocates. Microservices and API part managed by JHipster. Front-end development; Adaptive layout; Stabilization. The idea of our Сustomer is to create an application that goes beyond the traditional mobile application for dating. Solox helps lonely people find a company for their leisure (for a cup of coffee, at dinner, in the cinema or in the theater). The application makes it possible to determine the location of users, send notifications to those who are nearby, chat in a private chat, exchange photos, create a thematic group. Development of new functional; Implementing new features; Stabilization. Adaptive layout; Front-end development; Stabilization. The service grew out of our earlier project created in 2011 for a startup Admeld platform for rotation of Internet advertising and analysis of its effectiveness. Tailoring the functionality to the commercials, as well as developing and improving it, we had a platform to monetize traffic with ad videos with a friendly interface, support for a large number of services, as well as a rich and effective analysis results. Front-end implementation; Implementing new features; Stabilization. 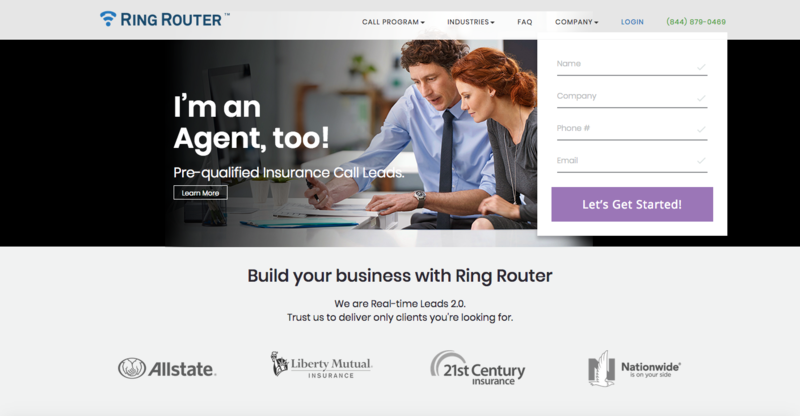 Ring Router’s Call Program is an end-to-end marketing solution that combines industry leading tech, with personal campaign optimization expertise to easily connect you with potential clients and simplify your sales process.